Installing Grasscloth wallpapers needn’t be a major trial; here are our tips to achieve the best results possible. Firstly, examine the paper closely to make sure it is exactly what you ordered and use samples held up to the wall to give you an idea of what it will look like when you’re finished. You’ll find that the bolt can vary, so it’s best to compare both edges prior to completing any cutting to ensure that they will match up; once you’ve made the cut there’s no going back so getting this right and producing an accurate match is imperative. This step is essential and should not be rushed through; do not underestimate the value of a properly prepared wall. Start by carefully removing any existing wallpaper or hangings including fixtures and fittings such as wall lights. You need your walls to be smooth, clean and dry; grasscloth paper will not stick properly to dirt, grease, dust, soap or mould. To clean you walls use a regular household detergent or a solution on one part ammonia and six parts water; be sure to rinse the walls with clean water so as to remove any residual cleaning agent. 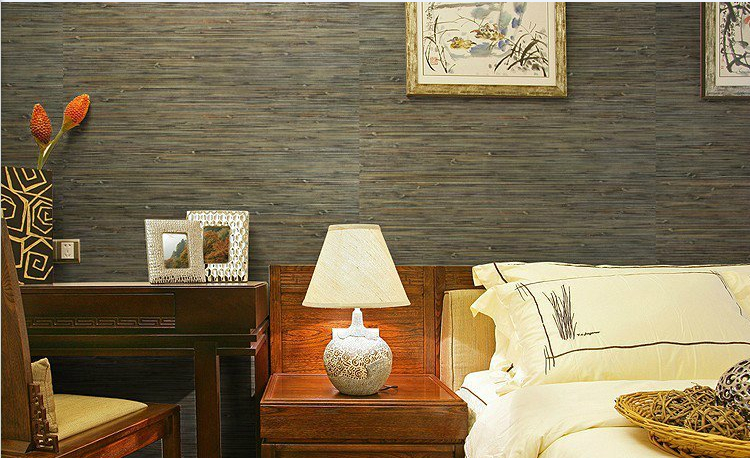 Firstly, always use non-staining, heavy duty wallpaper adhesive; this is essential for heavier papers like grasscloth. Grasscloth has to be reverse hung, so factor this in and always hang the strips in the order you have prepared them; this way you’ll avoid any matching disasters. Be careful with the adhesive; don’t get any on the outside of the paper as even non-staining adhesive will leave a slight mark.